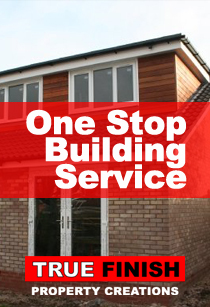 All your building needs in one place True Finish will provide you with a one stop building service. Established in the Midlands in 1999, True Finish has constructed an unrivalled reputation in the field of building and maintenance. Our motto is ‘Built to Last’ – quality is so important to us because our work will be our legacy! We have assembled a team of tradesmen who are all experts in their field, each with a wealth of experience in their profession. They are known for their ability and productivity, but also for their humour – we pride ourselves on having great customer relationships – and we have the testimonials to prove it! We are happy to undertake all projects – large or small, from a room refurbishment to a complete house build! Contact us today for a free quote & consultation. At True Finish we offer a ‘one stop’ solution to all your building needs, our start to finish service covers everything from recommending architects and structural engineers to undertaking all aspects of commercial and domestic work. If you can’t see what you’re looking for, just ask – our skilled tradesmen can turn a tool to pretty much anything! We pride ourselves on building great relationships with the people that we work for. Most of our work comes word of mouth and recommendations from happy customers! If you would like to talk to one of our satisfied clients, we would be happy to arrange this. Copyright © 2013 True Finish. All Rights Reserved.